We all love it when our pets go to the bathroom outside instead of on the carpet, but it can be pretty annoying when they track in dirt, mud and other debris after they finish. You could give them a full bath upon reentry, or fumble with a regular towel in order to wipe them clean, but bathing is impractical, and wrestling with an old rag isn't that fun either. Those of us that haven't given up the fight do usually choose the regular towel option, but old cotton rags don't clean that well, they take up too much space, they irritate pets, and you always have to guess where the clean spot is. This mitten offers a quicker, easier and more gentle way to clean your pet when they come inside, and it requires almost no effort on your part. After a quick how-do-you-do style handshake, or a fast wipe or rub, their paws, and every other dirty part, will be clean enough to let them inside, and you'll never have to worry about wet or muddy paws again. Just slip your hand inside to gain loads of surface area with incredible cleaning power. The palm on this advanced mitten is packed with thick, flexible fingers that are made from a top quality microfiber material that amplifies cleaning power while reducing the effort necessary to do a good job. As you grab your dog's paw, the soft fingers will conform to their body, and sink down into areas where dirt hides to pull it out, and lock it in. The little fingers will get in and around your pet's nails, and between the pads to ensure that every piece of mud, grass, dirt and whatever else is completely removed. Each fluffy chunk of microfiber is able to lift and hold an amazing amount of dirt, and thanks to the advanced material, all of that dirt will be locked in as it's picked up. The fabric is also highly absorbent to soak up any moisture, and it lifts and removes dirt and mud without any soap necessary. The action is totally gentle on fur and skin, but even stubborn dirt can be removed with just a single wipe. The hanging loop helps when putting it on, taking it off, or for storage when not in use, and the wide opening allows for quick access by anyone. Use it dry to thoroughly clean dirty paws in seconds, or get it wet and add soap to scrub Fido at bath time. It's totally washable and reusable, and will work for years without wearing out. Fast. Just grab each paw as they enter the house to remove most of the yucky stuff they collected outside. Grab again to thoroughly clean each little foot and ensure that your floors remain spotless. Effective. 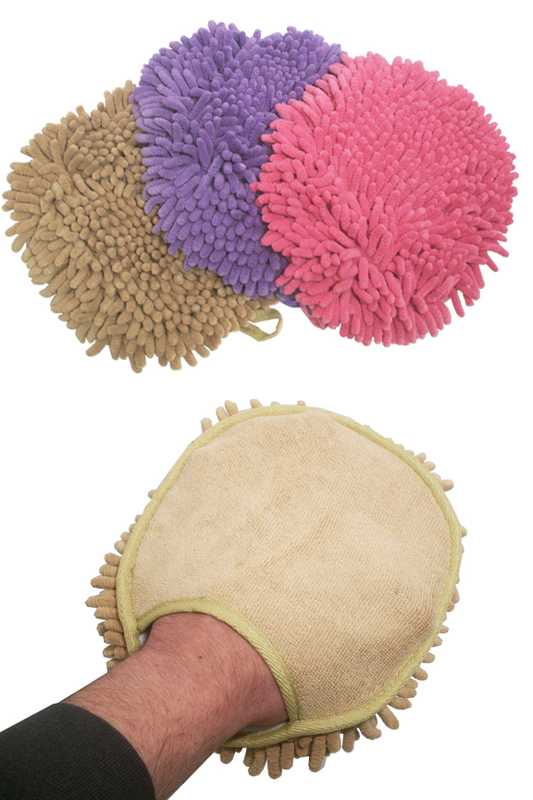 The microfiber fingers gently dig down between pads and claws to remove dirt from every crack and crevice without annoying your pet, or forcing you to work too hard. Because the advanced material does most of the work for you, a simple hand shake as they enter the house is all that is needed, and you'll never have to worry about muddy prints again. Easy On. The wide opening allows anyone to use it, and it also allows it to slide on and off with ease. Use the storage loop as a handle, and the process is even easier. Simply grab and pull to slip it on, then use the loop again to take it off without touching any of the dirt. Versatile. Perfect for wiping dirty paws, but also useful for other stuff. Use it to dry wet fur on a rainy day, or use it to lather and scrub while giving your dog a bath. It's designed for use on pets, but you can also use it to clean, dust and dry regular stuff too. Simple Storage. An integrated hanging loop allows you to store the mitt right where you use it. Simply hang in a convenient spot near your door so it's always ready when needed, and as an added bonus it will dry for reuse quickly, and without touching stuff it shouldn't. Long Lasting. Totally washable and reusable, this tool is designed for years of use, and it can easily be washed hundreds of times without wearing out or becoming ineffective. When you use a mitten instead of a towel or other rag, you never have to come in contact with the dirt. Your hand will be totally enclosed in the mitten so there is no way for your skin to get dirty. If you are using a towel to wipe paws right now, you know that this can be a valuable benefit. Some dogs come in with unknown substances on their feet, and others come back with substances that are clearly known based upon smell, and in either case, it is nice to not have to touch it, or worry about it touching you. Just slip this mitten on your hand and all sides will be protected and able to clean. When you are done, simply pull off using the cuff and you never have to touch what your pet stepped in. Using this paw cleaning tool is quite simple. Just put it on your hand and wipe away. If you use a technique of just gently grabbing your dog or cat's paw and then letting it fall, you will find that it is an effective way to get their paws clean without them having a problem with it. Because of the advanced fiber, and the addition of the chenille fingers, this single, gentle swipe will remove all signs of dirt in most cases. If your dog really had fun while he was out, you may have to wipe each paw twice, but in most cases, this would not be necessary. Once their paws are clean, simply slip the mitten off and hang for later use by the integrated hanging loop. 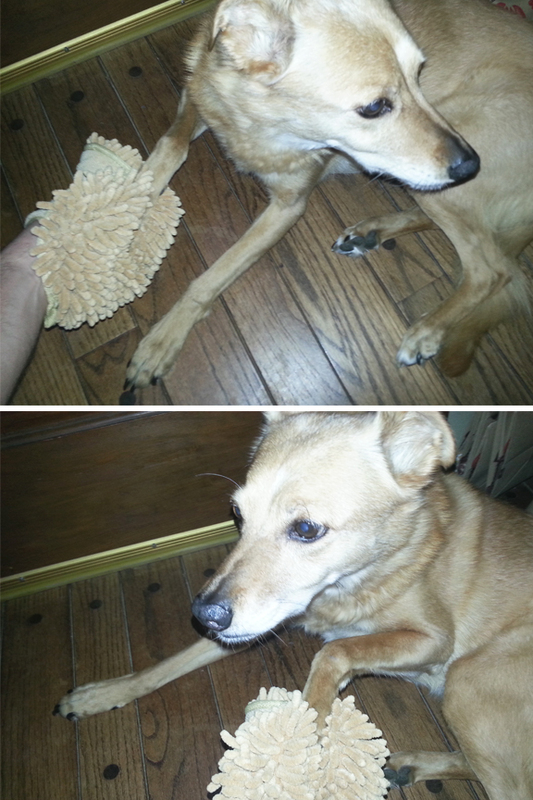 This paw cleaning tool can be used over and over again without ever needing to be replaced. You can rinse out light dirt and then hang dry, or you can give it a thorough washing by tossing it in the laundry. It will last through hundreds of washings before it ever wears out. Not just useful for making your pet inside friendly after she goes to the bathroom, this cleaning mitten can be useful for other tasks too. In most cases you will just use it dry to wipe paws, but you can also get it damp with water to increase it's ability. When damp, you'll be able to deep clean, and it can be used on paws as well as other parts. 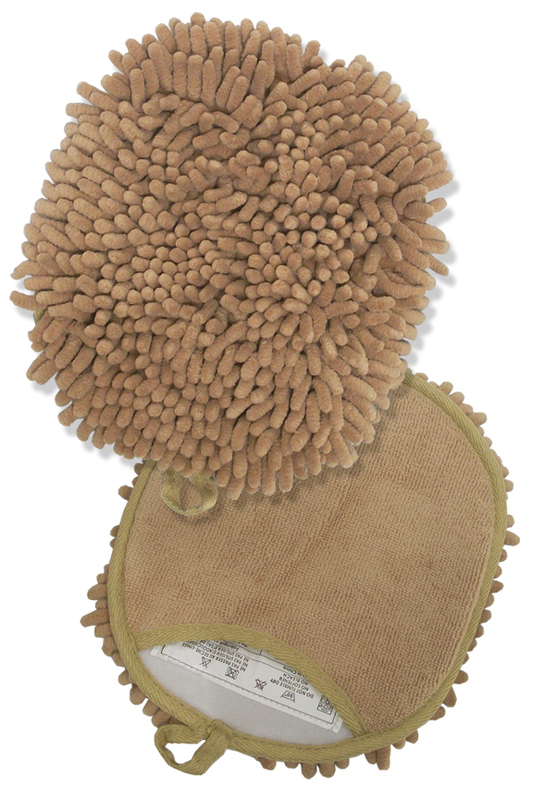 When bathing your pet, use this mitt to scrub and shampoo for a more thorough clean. It will hold tons of soap and water in order to work up a nice lather. The material will also facilitate cleaning by itself, so when you use it instead of your hands alone, it will make the job easier. Because the material is also highly absorbent, you can even use a fresh one for drying off your pet once you finish too. Due to it's size, it won't be practical for all-over drying of large dogs that are totally soaked, but smaller pets, or ones that have just come in from the rain can be dried quickly and easily. It won't self destruct if used for cleaning things other than pets, so you could also dust shelves, wipe counters, clean mirrors or even wash your car. This useful mitt is sure to be used over and over again thanks to it's versatility. Uses Removing dirt and mud from the paws of your dog or cat. Also useful for general washing and bathing. Wet Or Dry Both. Use Dry to quickly wipe clean debris, or use wet to deep clean or bathe. Cleaning Surface Front and Back. Chenille on one side, or reversible to terry on the other. We have one Catahoula dog but she has friends who visit. And they often go on walks wtih my husband in the country. When they return, after maybe a dip in the pond or just after a rain, the mud will be all through their paws. I got tired of putting them in the shower everytime, so I purchased these and the towels for pets. Between the two, our tile floors and house are a lot cleaner and my back feels a lot better from not having to bathe puppies. Great product that really works, as well as the blue pet towels. Wonderful! WORKS PRETTY MUCH AS ADVERTISED. HAPPY WITH THE PRODUCT. Love these paw mitts. When my dog comes in from outside, I just slip it on my hand and wipe each of her paws - it's so quick & easy. You can also wet the Mit for really muddy paws. Very easy to clean - just throw in the washing machine & hang to dry. Nice soft microfiber material too. I give this 5 stars or more! We have 2 fur babies and these mitts are so much more effective than a towel at wiping these 8 paws during rainy weather. I gave one to my daughter to try with her 2 fur babies and she absolutely loves it! I'm very happy with my paw cleaner mitts. I ordered two. I keep one upstairs near the door we come in from our walks daily. Then have another in my car for other days where we walk the beach or somewhere else there is dirt or mud. Easy to use, just put your hand in and clean the paws, rather than using a towel, which is sometimes cumbersome. Good product....slip your hand in and rub down the soggy dog...far more efficient than an old towel...we have a double-coat Eskimo Spitz, and this is the best way we've found to dry her off....it's a puppy mop! My Golden loved being washed with this mitt. Also, when I washed it, it looked like new!